Pope Francis focused his homily for the feast of the First Roman Martyrs on the witness of martyrdom, and prayed for all who continue to be persecuted for their faith, particularly in the Middle East. “The Church grows thanks to the blood of the martyrs. This is the beauty of martyrdom,” the Pope observed in his June 30 Mass. 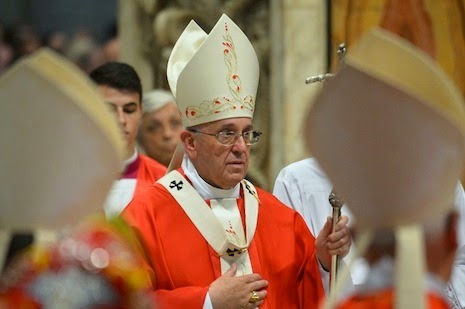 Centering his reflections on the death of the first Christians during the persecution of Nero in the year 64, Pope Francis emphasized to those present in the Vatican’s Saint Martha guesthouse what he has said many times before: that there are more martyrs now than in the early Church. Observing how this seed represents the Word of God that eventually grows and becomes the Kingdom of heaven, the Pope stated that it becomes the Church only with the strength of the Holy Spirit and the witness of Christians. This feast marks Pope Francis' last daily Mass until the end of the summer. His daily homilies will continue in September.